Since september 2014, SOA & BPM Suites are available as 12c Release 1. As you may know, the biggest difference in developer experience is the introduction of the QuickStarts, that installs a JDeveloper including a preconfigured IntegratedWeblogic that has the SOA and BPM components have installed. So there is no direct need for a complete Development Server to run and test your developments. By the way, in a project I do think you'll still need a Development Environment to do the end2end testing of your team's complete solution. But with SOA & BPM 12c you can't do with the standard JDeveloper 12c Studio. 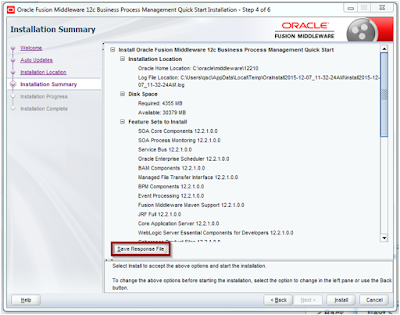 For the SOA 12.2.1 QuickStart a description of the installation process is described here. 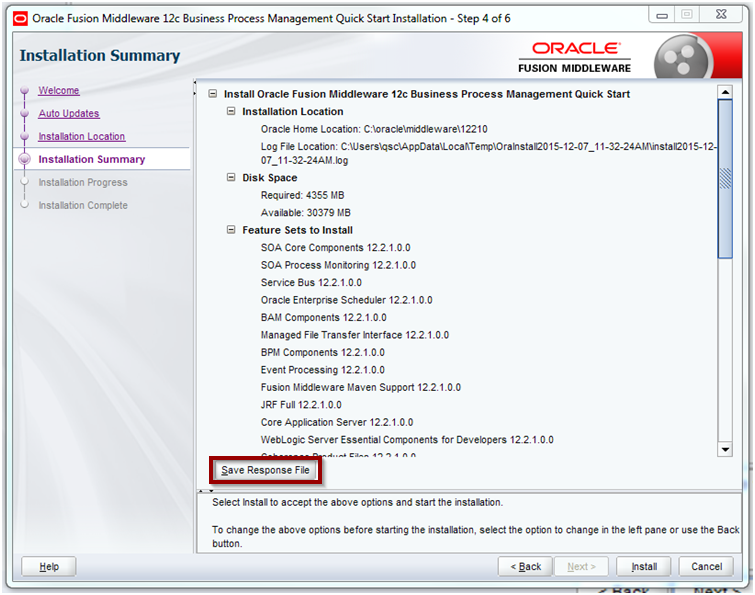 For BPM the installation is the same, as well as for the 12.1.3 version of both products. Important to notice is the need for a recent JDK 8 (currently update 65 or 66). Download and install the 64 bit version for your OS. Then for windows you should open an command window as Administrator. For Linux open a terminal window as the user you want to install the product with. Launcher log file is C:\Users\MAG\AppData\Local\Temp\OraInstall2015-12-09_09-03-34AM\launcher2015-12-09_09-03-34AM.log. Save this as 'bpmqs1221_silentInstall.rsp' (or adapt it if you use either the 12.1.3 version or the SOA QuickStart). You can change the ORACLE_HOME parameter in this file if you choose to put it elsewhere. I used this because I have all the Oracle software always in a oracle folder, and different JDeveloper installs under JDeveloper. I postfixed the version folder with BPMQS to explicitly state it's a JDeveloper resulting from the QuickStart and not a standard studio install. BTW: the variable '%cd%' means the current directory. The quickstart installer expects an absolute path to the response file. This one checks if Java 8 in the given update (in this example 65) is installed and if not it installs it. So the particular java installer should be in the same folder It does not check if there's another version, by the way. In the end it creates a seperate folder for the User data for JDeveloper. This includes the DefaultServer (Integrated Weblogic) domain. Normally it goes under the user's local settings. #  Copyright 2000-2012 Oracle Corporation. # should not change this property. # be changed by end users. # buffer deadlocks that may be due to locks not being released properly. # parser delay accordingly between the two delay numbers. # The minimum value of this delay is 100 (ms), the default is 300 (ms). # for "large" Java files (>100k). The delay is in milliseconds. # The minimum value for this delay is 500 (ms), the default is 1500 (ms). # are used for both Ojc & Javac. # Additional (product specific) places to look for extension jars. # Additional (product specific) places to look for roles. # partial translations, we throttle all locales other than en and ja. # languages. The default value is en,ja. # opening too many file handles, but can reduce performance.